If you’re at home in Parkwood and near a window around rush hour every day, you’ve heard it for the past few weeks like clockwork: a deep and mellow “Who cooks for you? Who cooks for YOU alllll?” resounding from the vague direction of the ravine. If you’re not at home that early, then you’ve probably heard an owl calling at dusk as they do almost every evening, again like clockwork. And if you’re too busy with dinner around sunset to hear them, then surely you’ve been awake at 3 or 4 in the morning when you’ve heard the comical sound of monkeys madly cackling back and forth to each other like someone flew over the cuckoo’s nest. If you’re like me, you drop everything and listen every time. 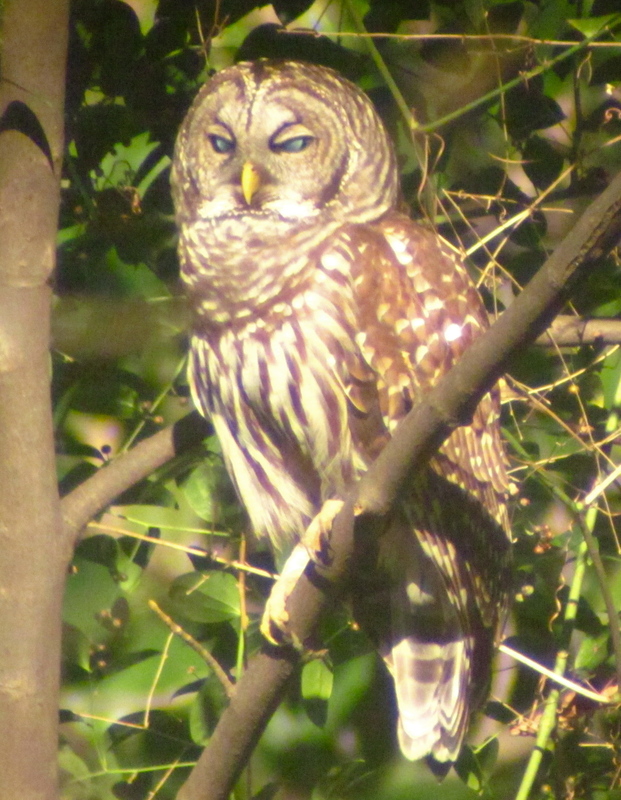 Almost everyone in Parkwood it seems, has become audibly acquainted with the vociferous vocalizations of our resident Barred Owls. But how many have seen more than fleeting glimpses of them? If you’ve been lucky maybe you’ve seen them a lot, but no matter how many times I see our Barred Owls, I feel lucky every time. I wanted to share my excitement with you in case you haven’t had a good look at one of our neighborhood’s most vocal birds and apparently one of its most bountiful breeders. How many of you moms and dads can say you’ve raised one or two new babies every year? 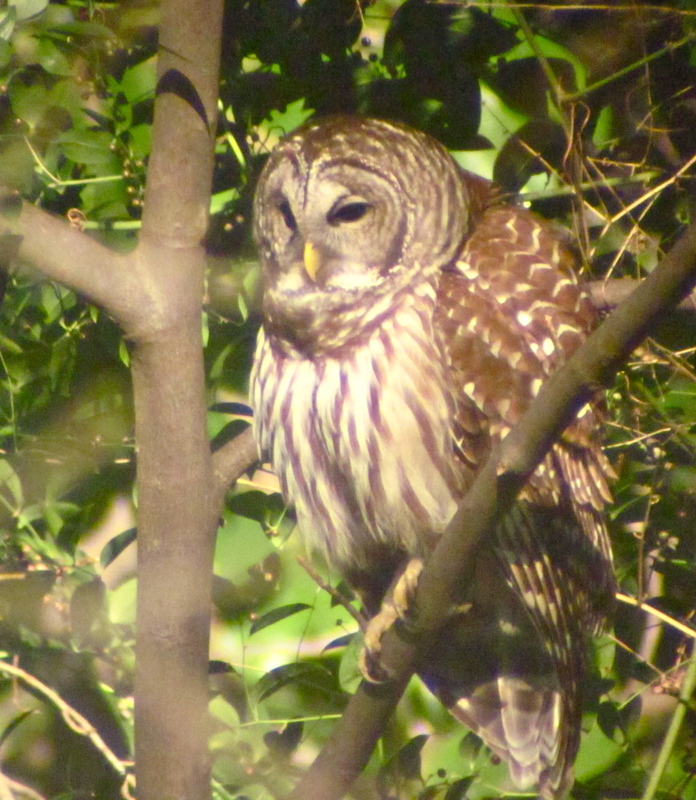 For the past week, a lone Barred Owl has returned to the same perch in the same tree, resting there out in the open from sunrise to sunset, giving me excellent views and photo opportunities. And like clockwork again, around 4 p.m. every day, he and his mate call back and forth to each other, “Who cooks for you?” I’ve been able to watch him calling through my spotting scope. Sometimes he has conversations with another Barred Owl far to the south of him, sometimes with one very close by in my neighbor’s yard to the north. This owl’s mate never made an appearance all week, until today. Bolot and I got to see both of them together this afternoon, swooping through the backyard’s blossoming canopy, landing near each other on another skinny sapling. And then…! We saw movement in the dimming light as one of the owls spread open its huge 3 1/2 ft wingspan and swooped down from its perch and then up to its next chosen perch: our barred owl box! 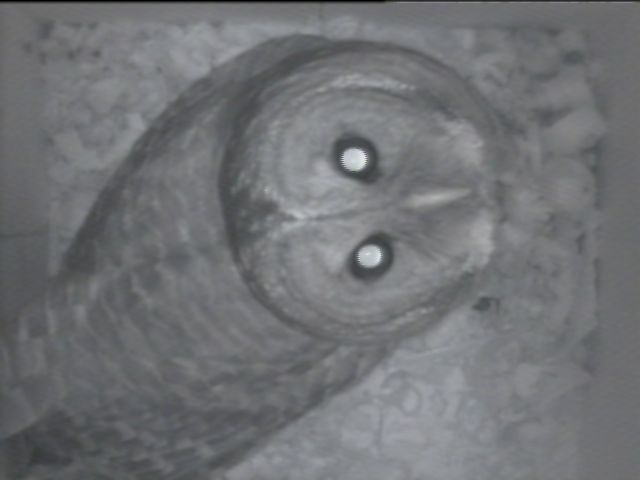 I ran inside to make sure our “owl cam” was recording images from inside the owl box. YES! It was! For the first time since we hung the box on Feb. 2, our camera caught an owl inside it. Although she only snooped around in the box for 3 minutes this time, it still made our day to see her checking out the new real estate, possibly for next year’s consideration. When she left the box, she and her husband flew off to look for supper in the woods behind our house. We went in the kitchen and heated up some pizza with smiles on our faces. For lots more photos of the Barred Owl on a branch and in the box on March 17, 21, and 22, go to Photo Galleries and then click on the Name That Bird gallery. 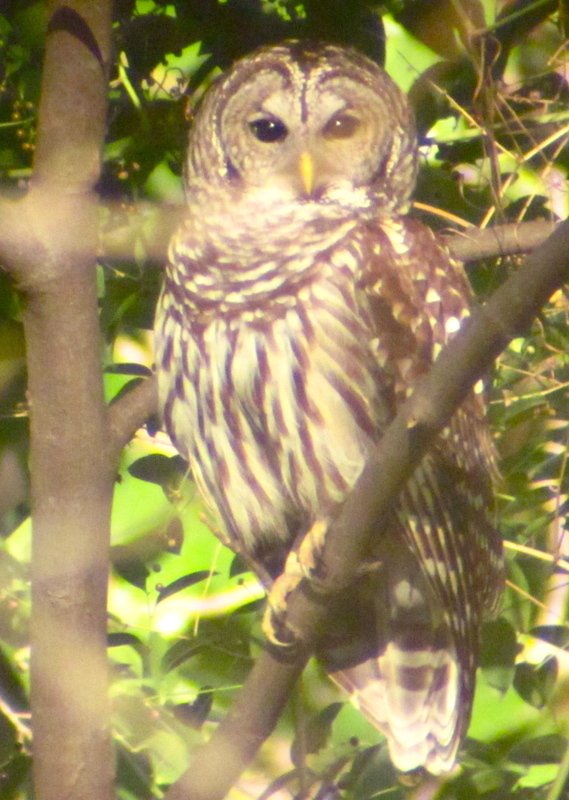 If you have photos or video you’ve taken of Parkwood Barred Owls, other birds, or any other wildlife and would like to share them on the website, please email them to pgc.webmasters@gmail.com. Some neighbors at Saturday’s Parkwood Park Cleanup Day mentioned that having some kind of Parkwood Bird Walk event might be a good idea for something to do with neighbors and their kids this spring. I’ve been birding for over 20 years and would be happy to lead a neighborhood bird walk one morning or evening. If you have questions about what species you’re looking at in your own yard, I’d be happy to help you ID birds too. Please email me if you think you would attend a scheduled neighborhood bird walk. Rebecca, I have enjoyed our owls for years and years but your post on the barred owls in our neighborhood was extremely well-written and wow–an owl in your owl box! Wonderful pictures and a great article. We are lucky to call this part of Atlanta home. I would very much love you to lead a bird walk. What a wonderful description and I love the pictures. Very cool pictures! I can hear the owl at night and have caught a glimpse of him a couple of times, but not as close as this. Thank for sharing these images – they are fun to look at.